Equal Employment Opportunity Plan A. The Iowa Department of Job Service in maintaining effective EEO activity pledges adherence to the principles of EEO in both staffing and delivering of services. B. Elements of Affirmative Action Compliance Program 1. Policy Statement. 2. The Iowa Department of Job Service has a full-time EEO/AA Officer who reports to the Administrator, Staff Services and Chief, Employee Services. 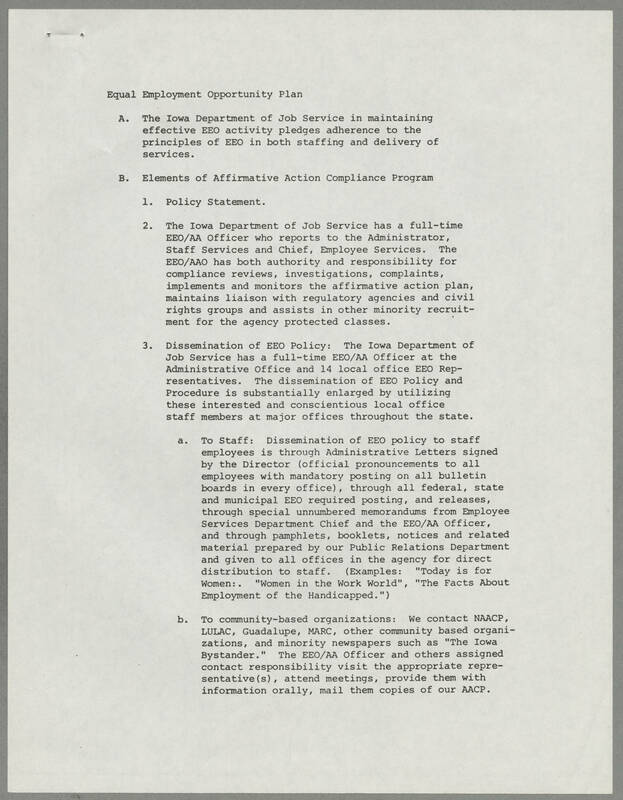 The EEO/AAO has both authority and responsibility for compliance reviews, investigations, complaints, implements and monitors the affirmative action plan, maintains liaison with regulatory agencies and civil rights groups and assists in other minority recruitment for the agency protected classes. 3. Dissemination of EEO Policy: The Iowa Department of Job Service has a full-time EEO/AA Officer at the Administrative Office and 14 local office EEO Representative. The dissemination of EEO Policy and Procedure is substantially enlarged by utilizing these interested and conscientious local office staff members at major offices throughout the state. a. To Staff: Dissemination of EEO policy to staff employees is through Administrative Letters signed by the Director (official pronouncements to all employees with mandatory posting on all bulletin boards in every office), through all federal, state and municipal EEO required posting, and releases, through special unnumbered memorandums from Employee Services Department Chief and the EEO/AA Officer, and through pamphlets, booklets, notices and related material prepared by our Public Relations Department and given to all officers in the agency for direct distribution to staff. (Examples: "Today is for Women:. "Women in the Work World", "The Facts About Employment of the Handicapped.") b. To community-based organizations: We contact NAACP, LULAC, Guadalupe, MARC, other community based organizations, and minority newspapers such as "The Iowa Bystander." The EEO/AA Officer and others assigned contact responsibility visit the appropriate representative(s), attend meetings, provide them with information orally, mail them copies of our AACP.